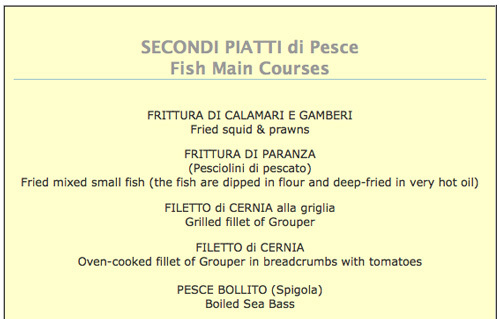 These seafood restaurant menus continue the Italian restaurant menus collection from Maremma in Tuscany and Lazio: Italy's best kept secret where the best of "antipasti, primi piatti e secondi piatti" - starters, first and main courses - are simply prepared with love from fresh ingredients. I hope they help you with some great seafood menu ideas of your own. Better still, why not plan a visit to Maremma and try each of these dishes out for yourself?! There is no shortage of places in this special part of Tuscany in which to eat exquisite fish dishes, as Maremma's long and spectacular coastline is home to many ports and fishing villages where the daily catch comes in every morning on small one man boats eagerly awaited by locals and restaurant chefs alike. In this page you will find some the seafood dishes - antipasti, primi piatti and secondi piatti - from the Osteria Il Fanta in the medieval hill town of Gavorrano (only a short drive from Maremma's beaches and coast). The Osteria Il Fanta can be found in the centre of Gavorrano, very close to the small car park adjacent to the central piazza. Summer opening times: 19:30. Also open from 12:30 on Sunday for lunch. Winter opening times 12:30 and 19:00. Closed Tuesday.